22 x 30 mm 18K white gold case set with 110 brilliant-cut diamonds (approx. 0.5 ct), 6.7 mm thick, diamond crown set with a brilliant-cut diamond (approx. 0.1 ct), diamond bezel, gem set dial set with 237 brilliant-cut diamonds (approx. 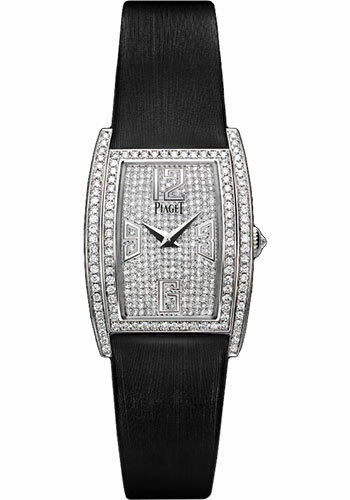 0.5 ct, 57P quartz movement, black satin strap, ardillon buckle set with 13 brilliant-cut diamonds (approx. 0.1 ct). Water resistant to 03 ATM. 22 x 30 mm 18K white gold case set with 110 brilliant-cut diamonds (approx. 0.5 ct), 6.7 mm thick, diamond crown set with a brilliant-cut diamond (approx. 0.1 ct), diamond bezel, gem set dial with 237 brilliant-cut diamonds (approx. 0.5 ct) with 18K white-gold hour markers, 57P quartz movement, 18K white gold bracelet set with 672 brilliant-cut diamonds (approx. 3.9 ct), integrated buckle. Water resistant to 03 ATM. 22 x 30 mm 18K white gold case set with 110 brilliant-cut diamonds (approx. 0.6 ct), rose-cut diamond crown, 18K white gold bezel with diamonds, silvered dial with 176 brilliant-cut diamonds (approx. 0.5 ct) and 18K white gold hour markers, caliber 57P quartz movement, 18K white gold bracelet set wotj 672 brilliant-cut diamonds (approx. 3.8 ct), folding clasp buckle. Water resistant to 3 atm.